Sonos, long known for its more expensive internet-connected speakers, released an entry-level model called the Play:1 in October. I’ve been using two loaned Play:1 review units from Sonos for the last couple of weeks, primarily to listen to internet radio and subscription music from Rdio. After a slight initial learning curve, I quickly fell in love with the devices — but I also discovered some shortcomings that may be annoying enough to make me wait a bit longer before I buy my own Play:1. The Sonos Play:1 is about the size of a coffee can. Sonos has been a connected speaker pioneer, and the Play:1 essentially offers the same functionality as its bigger and pricier predecessors, albeit in a smaller and slightly less powerful package. The Play:1 is a connected wireless speaker that can be controlled with your mobile device or desktop speaker and paired with other Sonos speakers on the same network for synchronous playback. Multiple Sonos speakers within the same network can easily be synched. Sonos speakers can either stream music from your local library — saved on your computer’s hard drive or a network attached storage drive — or access cloud music services; and the latter is arguably where these kinds of speakers really shine. Sonos currently offers support for a number of online music services, including Spotify, Pandora, (S P) Rdio, Songza, Last.fm, Rhapsody and others, and access to a few thousand online radio streams via TuneIn. 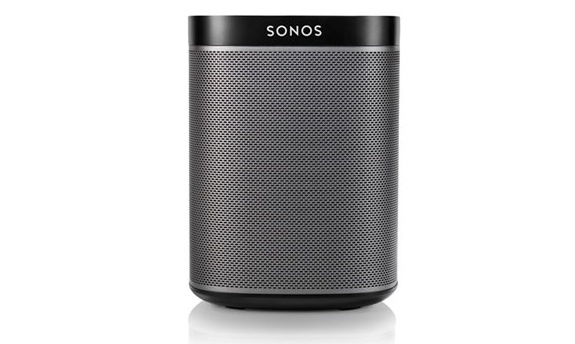 The key difference between a Sonos speaker and a Bluetooth or even an AirPlay-eanbled speaker is that Sonos maintains its own connection to the internet. You can use your phone to tell the speaker which digital music stream to tune into, and then turn off your phone, or use it for something else — and the speaker is going to keep playing. It’s even possible to schedule streams, and for example begin each morning with an NPR stream, whether your phone is charged at the time or not. Reviews of HiFi equipment usually feature a whole lot of data points: wattage, impendance, frequency curves — it might get home theater geeks and audiophiles excited, but confuses the heck out of the rest of us. Sonos doesn’t do anything like that. The company purposefully doesn’t talk about specs, and instead highlights the feature set of its connected speakers. It’s a bit Apple-like, if you will. Instead of confusing consumers with chipset speeds, Apple tends to highlight what you can actually do with an iPad. The Play:1 joins the Play:3 and Play:5, which are sold for $300 and $400, respectively. As a consumer, I think that’s just the right approach. Sure, I took some acoustics classes in college, and I could probably make sense of most of these numbers if I Googled a bit — but years of covering technology have taught me that most specs can be pretty meaningless. More megapixels alone don’t equal better photos, and louder speakers don’t necessarily make your music sound better. And here’s another thing you need to know about my music consumption: I’m a “good-enough” kind of guy. I’m not necessarily going to buy the cheapest speaker possible, but I’m not above using a $50 Bluetooth speaker to occasionally listen to podcasts and radio streams in the kitchen. And when I really want an immersive music experience, I usually reach for my headphones (Sennheiser HD-280 pro, if you must know). That’s why I also haven’t bought a Sonos speaker before. The company’s Play:3 and Play:5 speakers, priced at $300 and $400 respectively, just seemed a bit too steep, not to mention the company’s $700 soundbar. Oh yeah, did I mention I’m cheap? The Play:1 is also available in white. In other words: I may just be the best customer for an entry-level offering like the Play:1. And with that in mind, you also won’t find long diatribes on the sound quality of the device here. To my ears, the Play:1 sounded great when turned up a bit, and good but a bit thin when playing quietly. I placed the two speakers in two connecting rooms, so I paired them frequently to have the same music playing on both synchronously, which made for great carpets of sound filling the house. However, I didn’t really make use of a feature that turns both speakers into a true stereophonic set because the placement didn’t lend itself to this kind of use. And with that, I occasionally asked myself: What ever happened to stereo? The Play:1 is a wireless speaker, but Sonos likes to operate its own wireless network to ensure that it can cover your entire house, and not fight with other resources bogging down your router. That’s why you either have to connect at least one Sonos speaker via Ethernet, or use a bridge — kind of a separate router for Sonos components. Connecting a bridge is easy enough, but it felt a bit like I was adding yet another device to my already crowded home network. 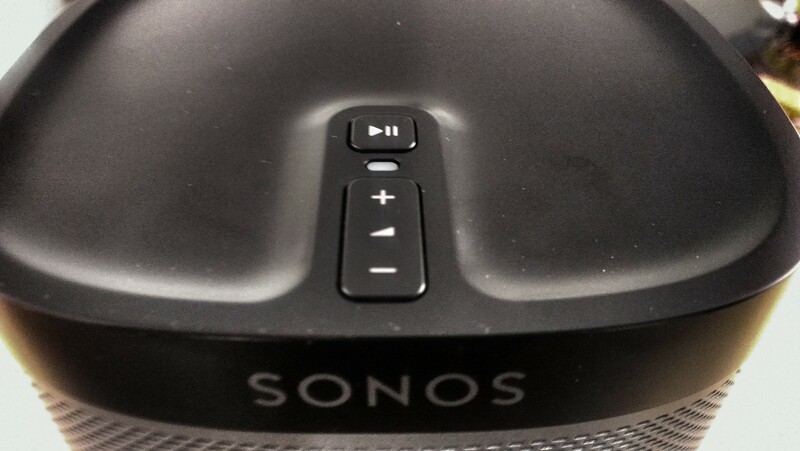 Getting your speakers to connect to the bridge, and then having them discovered by the Sonos mobile app, is also an easy, painless process. But I found that actually getting them to play some music was anything but. The Sonos app prompted me to register the speakers, but said little about the benefits of this step. I bypassed it, and subsequently was unable to access any online services. Attempts to do so left me in a loop, without any clear explanation of what was wrong. For about two hours, I really, wholeheartedly hated Sonos. More thorough documentation would have helped a lot. Playing content stored locally on my mobile devices was a snap, although accessing my Macbook’s iTunes library was a bit more challenging, and involved changing file sharing settings on the OSX system level even though I already shared my library through iTunes. 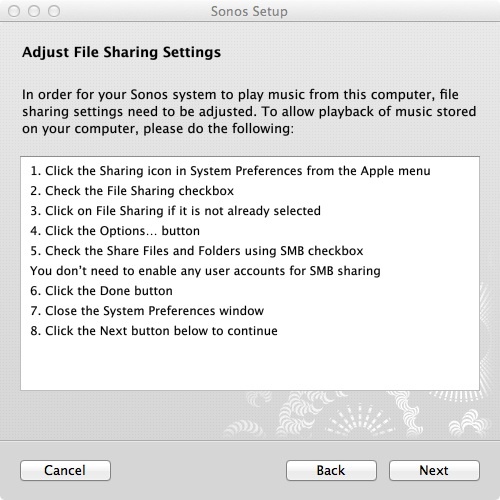 The advantage of that approach is that my computer will be sharing files with Sonos even if my Sonos or iTunes apps aren’t launched, but it was still a few extra steps that seemed to complicate the issue. Sharing local content with the Play:1 is still a bit complicated. The good news is that you only have to set it up once. However, once the setup was done, playing local music was a bliss. I did occasionally play some content stored on my iPad, but also gave the Sonos access to my music collection stored on a network attached storage drive, which made it possible to listen to tracks even when my computer was turned off. I spent a lot of time listening to my favorite Los Angeles radio station KCRW through the Play:1, and quickly learned to love its physical controls. The speaker not only features a volume rocker, but also a play and pause button, which is great if you want to take a break and quickly mute the music for a phone call, but also provides a way to start playback when you come back home after a day at the office. Especially with online radio listening, the play/pause-button quickly became one of my favorite features of the Play:1. I also tend to listen to KCRW a lot through the station’s dedicated iOS and Android apps, and occasionally, something strange would happen: The Play:1 would stream something different than KCRW’s mobile apps. This could be because Sonos gets fed by TuneIn, but the result was still confusing. Also puzzling: Sonos allows users to sync their music across multiple speakers, and I often had my streams playing in perfect unison in the living room and my office den. But occasionally, I’d launch a KCRW stream on one speaker, then press play on the other, and have both devices play the same thing, but with a slight delay. That’s because both speakers were playing the same stream independently as opposed to in sync, and re-syncing them through the Sonos app usually took care of the problem. However, it would be great if Sonos speakers could detect that they’re playing the same thing, and automatically sync their outputs, or if there was a way to sync speakers through their physical buttons. Aside from radio listening, I also spent a whole lot of time listening to music from Rdio with the Play:1. Rdio is my music subscription service of choice, but I could easily also have used Spotify or Rhapsody, and listening to whole albums as well as my personalized Rdio station — kind of a mix of favorites and personalized recommendations — is great. One of my favorite ways to use the Play:1 was streaming subscription music. Except for one thing that kept bugging more and more the longer I used the Play:1: Sonos requires you to use its own app, as opposed to a service’s native app, to control playback. That’s okay if you just want to launch a radio stream, or play a couple of MP3 files saved on your computer or iPad. But it’s a serious shortcoming when you’re dealing with a subscription service that tries to differentiate itself from the pack with a whole lot of advanced features. Take Rdio’s personalized radio stations, for example. The service has gone to great lengths to combine a Pandora-like experience with true on-demand listening. 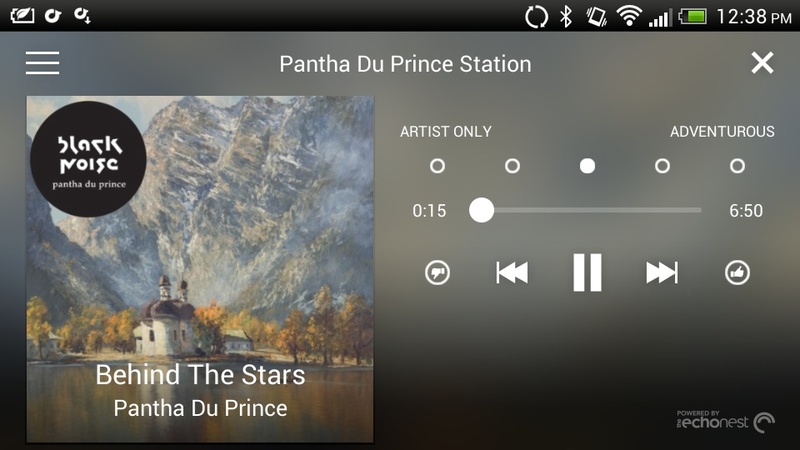 Users can listen to stations programmed for artists, stations based on the music their friends on Rdio listen to and personalized stations based on their own listening behavior. Each station can be adjusted to be more or less adventurous, and voting on tracks can affect programming in real time. Sonos has personalized stations for you and your contacts, but those are more or less static, and only offer the option to skip tracks. While listening to Rdio via Sonos, I kept running into this issue of limited support for third-party features over and over again. A track that I really liked would come up, making me want to add it to a playlist. Unfortunately, the Sonos app doesn’t allow me to edit Rdio playlists. I could add a track to a Sonos-exclusive playlist, but then it would be inaccessible the next time I’m at the office. Sonos has done some work to integrate tighter with Spotify, but it’s frustrating that these features aren’t available for many other services. Give me third-party app support! All of this could be avoided if Sonos was integrated with third-party apps. That way, I could use the Rdio app to listen to Rdio, and apps from other music services to listen to their offerings. Sonos has said that it is working on making “play to Sonos” functionality available to third-party developers, which is great news — I just wish it was already there. Third-party apps are often so much better than the Sonos controller app. The lack of third-party playback also made me sometimes wish that Sonos had — wait for it — Bluetooth or AirPlay support, just so that I could extend playback to more sources of content. I’d be watching some YouTube-hosted podcast on the iPad in the kitchen, then go to the living room — and wish that I could just switch the audio output to the Play:1 speaker over there. I know that the folks at Sonos have strong feelings about Bluetooth, but as a consumer, I felt like the company’s quest for the perfect solution actually made the Play:1 less useful. So how did I feel about the Play:1? At the end of the day, I have to admit that I loved it. If you’re like me and are looking for an easy way to listen to online music that won’t break the bank, the Play:1 is definitely worth a close look. At the same time, my struggles with the proprietary nature of the Sonos ecosystem have thus far stopped me from going out and buying one. It’s great technology that also sounds good, but it could still be easier. That being said, the day that Sonos opens up play to functionality to third-party developers, I’ll be the first one to pick up one of these. I am 120% happy with my Sonos system. I have a Play:5 for 2 years now and didn’t use it much until I bought half a year ago a Playbar/SUB/2xPlay:1 system connected to the Samsung TV with an optical link. We use this Sonos subsystem as an advanced “speaker set” for the LED TV but also for standalone streaming music from Spotify. The TV audio finally is -thanks to Sonos- really superb. Sonos plays stereo when only stereo is provided (either over the optical link with the TV or over the air by the Sonos bridge) or plays 5.1 surround (best from a DVD). This Sonos audio subsystem switches back and forth between Spotify, audio from the TV (either in stereo or Dolby 5.1). And configuring the set up takes really one minute; doesn’t require any skills. You can’t believe your eyes and ears ! We have a Sonos 5 in our living room. This was before the Playbar and at the time my only complaint would’ve been that I couldn’t hook it up to the TV. Well the Playbar came out to resolve that issue but at a premium price. I don’t think we are ready for that investment quite yet. 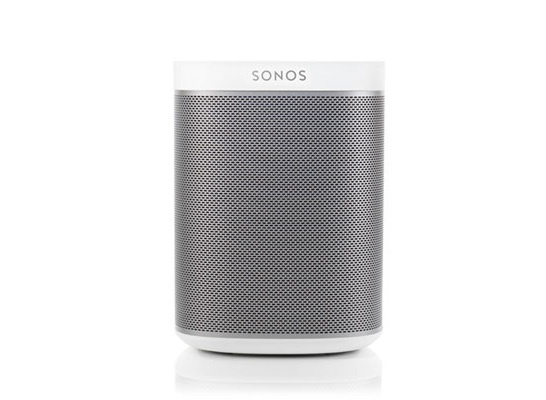 However we are interested in expanding our Sonos network and likely will get a Play 1 for our daughters bedroom. 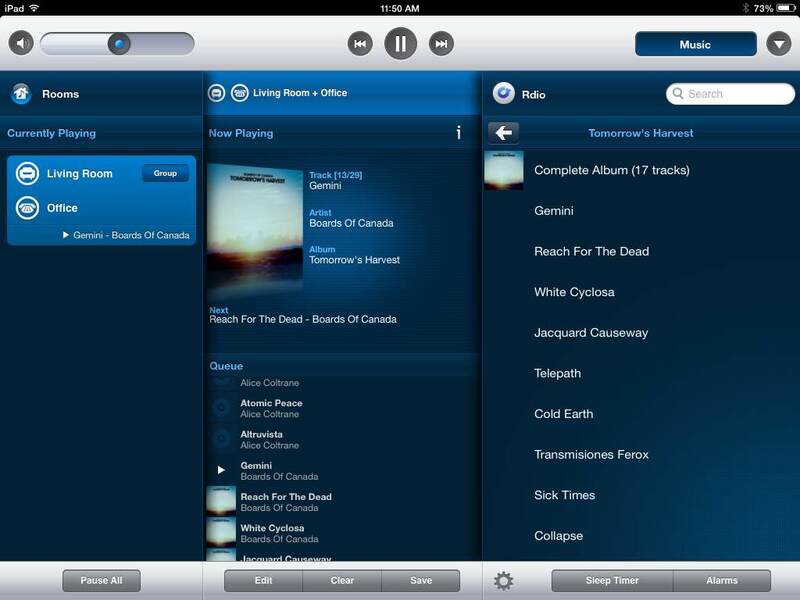 We use Songza primarily and through the Sonos app I think we get what we need out of it. It is a quality product and loved by our family. In fact when we had our house broken into and lost all our electronic gear, my wife wanted to immediately replace the Sonos with our insurance money. this is a fantastic review, thanks very much! going to jump in with a play 5 for the living room (need a line in for my record player) and two play 1s. 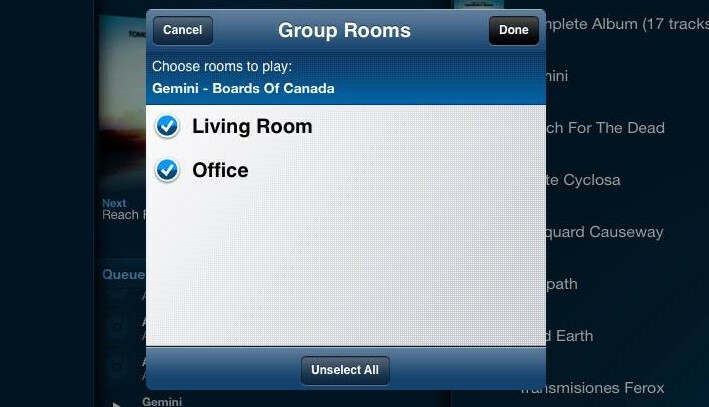 great to know sonos are likely to add a “play to sonos” option. a lot of (very) new music doesn’t get released on major platforms like iTunes/Spotify, just youtube, bandcamp or soundcloud, so being able to stream from these will be ace! I have a Play 1 with Bridge. Will buy another plus connect. Fab system, after opening boxes 5 mins and I was listening to internet radio and no drama. It just works so easily. Sound quality is good enough for me. The ability to add a audio jack to the PLAY 1 components would be nice to have. I could then stream my CD instead of having to rip and then add it to the Playlist. And hopefully SONOS will add integration for Subsonic. I too was hoping Sonos could replace my traditional speakers to get rid of all those nasty wires. But without support to stream a VLC, YouTube or DownCast stream, I still found myself using the traditional active speakers again. And to add one more little annoyance (one of the key reasons I returned my Play:3): The Sonos App does not support iTunes Match streaming. I don’t want to have my whole collection downloaded to all devices.. Even my laptop only has a fraction of my collection downloaded. There is no way to stream these songs from iTunes Match in the Cloud to the Sonos. So I’m still looking for a real solution to replace my wired active speakers. Man, these vendors are so close to awesome audio solutions to satisfy the tech/audio enthusiast and his family who just wants it all to work from wherever. I want to love Sonos, but know it’s limitations will just be annoying. Alter your ecosystem to allow ACCESSIBILITY to your SOLID products. You can still focus on protocols that you feel offer a superior feature-set. You will get your revenues from the masses that will follow. I Love the sonos play 1 a lot. Me and my bro getting a great fan of sonos play 1. He has written a great review about sonos play 1 and also reveal some secret of sonos play 1 and with a great deal. Janko you are griping about edge cases – the functionality is unmatched in the industry – this is the future – get on board if you are indeed a technologist. What do you use for your stereo then? I would like Sonos to add an Aux jack to the Play:1 and Play:3 so that I can use them as TV speakers in my guest room or in my son’s dorm room. My Sonos experience (one Play:3 and a SoundBridge) leaves me wishing for full iTunes capability. I use both laptop and iPad to watch video from various sources, but my main video library and viewing is via iTunes. It kills me that I can’t play that iTunes audio track through the Play:3. I listened to the 1 and the 3 in the shop, as I as going to buy the 1. I noticed better high end notes with the 3, and also a little better bass. So I plumped for a pair of 3s, costing more. Stereo operation is good. Don’t regret it as they do a great job and one day I might get another pair for another room. Another fabulous mono speaker system for the in-crowd! Even the small “stereo” speakers do little to provide a true stereo experience, with good separation and a nuanced soundstage. For the kind of situations this will be used for, I’d rather have 1 good mono speaker than a tinny, bass-less stereo speaker. I haven’t heard it yet, but it looks like it will outperform the similarly priced Jawbone Jambox. I have 15 Sonos speakers throughout my home and absolutely love their products, app, and ease of set up and use. Having been using Sonos for 4 years now, I haven’t had a single problem in the areas of connectivity or the lag mentioned in this review between zones. I recently picked up 2 PLAY1’s for our screened in porch (as they are humidity proof) and stereo paired them and hung them by wall mount, and they sound amazingly good. I thought given the size of the PLAY1’s that they would be lacking in bass and I’ve have to consider moving a SUB out on the porch when we entertain, but the PLAY1’s deliver amazing bass, especially given their size. I love my Sonos and can’t see to see what these guys put out next! I LOVE my Play 1!!! I also love my sonos play 1. Though I have 2 sonos speaker one is sonos play 3 and another is sonos play 1. But I love sonos play 1 for its robust excelent performance. hats off to sonos play 1.
ok..now I might sound creepy but guys An internet connected set of speakers will be as much vulnerable as out routers i.e. they will just get security updates/patches for about 1year until the manfacturer stops manufacturing/marketing it. Why am I stressing for security? Because malware infection, remote code execution is just a step away from your lovely looking Internet connected speakers. That too wirelessly. I am sure other security experts know what I am talking about. Sonos has been around for a long time. I have friends who have been getting updates for close to a decade. I’ve had Sonos for about 3 years and get all the updates. Prior to smartphones Sonos used to sell a touch pad remote for controlling their system for about $200. They jumped on the smartphone / tablet bandwagon and provide a free app. My personal experience is that Sonos is customer friendly with their practice. And just to be clear, Sonos speakers don’t connect directly to the internet. They connect (wirelessly) to the Sonos Bridge (using their own proprietary protocol, which has some sort of handshaking and encryption). The Bridge unit likewise doesn’t connect directly to the internet, it connects to the router on your home network. So, presumably, you’re running a router with NAT, so your home Sonos network will be protected from any outside hacking by that. Of course, never say never when it comes to malicious hackers, but this stuff is pretty well protected and these are certainly not speakers connected directly, unprotected, unfiltered to the internet. You got sonos wrong bro it’s not internet connected speakers. Sonos can work fine even with a router just using local area network. Except for one thing that kept bugging more and more the longer I used the Play:1: Sonos requires you to use its own app, as opposed to a serviceâ€™s native app, to control playback. Thatâ€™s okay if you just want to launch a radio stream, or play a couple of MP3 files saved on your computer or iPad. But itâ€™s a serious shortcoming when youâ€™re dealing with a subscription service that tries to differentiate itself from the pack with a whole lot of advanced features. Iâ€™m with you in that Sonos should have either a range of apps to suit customer preferences, or an API for developers. Having to re-sync my music every time I change a password is annoying. And as you discovered, you tied into the Sonos ecosystem which is both good and bad. Frankly, I would rather use iTunes to manage my extensive music connection. The Play5 sounds great, but the system as a whole requires better integration into the world of music. We are beyond connection as the value proposition.